THE RIVER JANUARY 10, 201412 Sheepshead Are Now Added To The Mixed Bagby Capt. Matt MitchellFor non-stop action and a great mixed bag of fish, our winter fishing on shrimp is hard to beat. Catching 10 or more varieties of fish on a trip has been pretty standard and although most are on the smaller side of the slot, its great just to have bites every cast. Add to that, you just simply do not know what the next fish will be. Sheepshead really have started to show up in better numbers and with many more keepers in the mix than we have seen in the last month. Most deep mangrove channels and deeper docks with fast moving tide held good numbers of the tasty fish. For anglers looking to take home a good eating fish, sheepshead are at the top of the grocery list right now. Chunks of shrimp fished on jig heads or on a small hook with a split shot was the go-to rig. These fish take a little getting used to as they hit the bait fast and multiple times. Generally, when the line goes slack is when the fish has the bait in its mouth; wind tight and give them a few little pops of the rod tip to put the hook in their hard mouth. Although we have not really started to see the pre-spawn monsters, the little bit of cold weather in our future should really have this bite going off. Our big one of the week measured right at 18 inches. Minimum size on sheepshead is 12 inches and anglers are allowed a generous limit of 15 per person per day. Many places I targeted sheepshead this week held another winter staple of our area, black drum. This relative of the redfish has a slightly wider body and black and white stripes. As they grow larger, the stripes begin to fade. They dont fight quite as hard as their cousin, the redfish, size for size, but on light tackle a 5to 15-pound drum is a good fight and a fun fish to catch. What often surprises me is the large size of the black drum you catch while fishing with a small chunk of shrimp often intended for a sheepshead. Small black drum fillets are hard to distinguish from redfish; they even have the little red spots towards the tail section of the meat. As these fish get bigger though, they are five pounds. Trout fishing was also a pretty consistent bite this week though most of the trout caught seemed to be right at or just over the 15-inch slot. Most places that held trout also had good mixed bag action with jacks, Spanish mackerel and ladyfish. Deeper bays in the Ding Darling Refuge held big schools of trout. In deeper water, bouncing a shrimp on the bottom was the way to go while on shallower flats a popping cork caught more fish. Its been over a month since we had a big cold front come through (around Thanksgiving) that really cooled things off. Because of this, much of our usual winter fishing is just not quite in full swing. Usually by what we refer to as rat redfish (16to 20-inch reds), should be all over the narrow mangrove creeks where they spend the winter, but they have not showed up in the deep back country yet. The few times in the last month that tides have been high enough to target redfish out in the open bay on mangrove shorelines, the action has been really good. As soon as things really cool off, Im sure these redfish will make the move to these warmer sheltered creeks they call home all winter long. Capt. Matt Mitchell has been fishing local waters since he moved to Sanibel in 1980. He now lives in St. James City and works as a back country fishing guide. If you have comments or questions email captmattmitchell@aol. com. Kathleen Smith from Boston with a black drum caught while fishing with Capt. Matt Mitchell this week ISLAND MARINE SERVICES, INC. NEW MOTOR SALES REBUILT POWERHEADS FACTORY TRAINED MERCURY MARINER JOHNSON EVINRUDE SUZUKI YAMAHA OMC I/O'S MERCRUISERCourteous Professional Marine Repair Service Dockside Service Serving Sanibel & Captiva For Life472-3380 466-3344 Your Bottom Call on Paint PricesDave Doane NEW MOTOR SALES REBUILT POWERHEA D S FA C T O RY T R A I N E D MER C U RY MARINER JO HN SO N EVINR U D E S UZUKI YAMAHA O M C I/ O S MER C RU I S E R C ourteous Professional Marine Repair S erv i ce D oc k s i d e S erv i ce S ervin g S anibel & C aptiva For Li f e Y B t t Yo ur Botto m Yo ur B ot to m C Call on Paint Prices Call on Paint Prices Da v e D oa n e 1Send Us Your Fish TalesThe River Weekly would like to hear from anglers about their catches. Send us details including tackle, bait and weather conditions, date of catch, species and weight, and include photographs with identification. 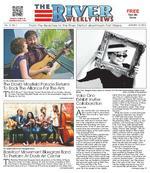 Drop them at the River Weekly, 1609 Hendry Street, Suite 15, Fort Myers, Florida 33901, or email to press@riverweekly.com. BOAT RENTALSFishing Cabbage KeyDolphin Watching Captains Available472-5800Jensens Marina Captiva Island 481 4 7 33 12600 McGregor Blvd, Ft Myer s www. scuba vi ced iv e r s com S wim with the Fishe s Local Waters/ Local Charts Class Offeredsubmitted by Cdr. Mary Smelter, The San Carlos Bay Sail & Power SquadronThe San Carlos Bay Sail & Power Squadron, a unit of the United States Power Squadrons, will be offering the popular Local Waters/Local Charts class. The class will be held on Saturday, January 18 from 8:15 a.m. to 12:30 p.m. The class is directed towards new boaters and boaters new to the area as well as those wishing to learn chart reading. It will provide the boater with some of the basics of navigation, oriented to the Fort Myers area. Students will be using chart #11427, and they must bring this chart to class. Optional On-The-Water training is also offered at a later date; check with the class instructor for details. The cost of the class is $45 per person. The class is being taught at the San Carlos Bay Sail & Power Squadron classroom, located at 16048 San Carlos Blvd. at the corner of Kelly Road (across from ACE Hardware). Students can register online at www. scbps.com or call 466-4040. THE RIVER JANUARY 10, 201420 League Of Denial Sheds Light On Concussion Issue Plaguing Footballby Ed FrankIn the midst of the frenetic National Football League playoffs leading to Super Bowl XVIII on February 2, is there any doubt that professional football is the most successful and captivating sport in America? Yet mounting questions arise as to the brutality of the sport and the denial of the NFL that crushing injuries have resulted in brain damage, memory loss and even suicides by former players. In addition, there are statistics that reveal an increasing number of parents are keeping their children off the football fields and pushing them into other sports such as soccer. A recent ESPN report stated that the popular Pop Warner youth football program has seen a 10 percent decline in participation that is attributed to the concern over concussions. This controversial issue was detailed in an in-depth investigation by two veteran reporters in their new book entitled League of Denial the NFL, Concussions and the Battle for Truth. Mark Fainaru-Wada and Steve Fainaru, both ESPN investigative reporters, said the purpose of the book is not to destroy professional football but rather to shed light on the denial of the NFL that head injuries have led to brain damage. This is despite the fact that the NFL recently paid $765 million to settle a lawsuit brought by nearly 6,000 former players and their families. It is interesting that these two prizewinning writers wrote this best-selling book while employed by ESPN which is one of the major networks that broadcast NFL football. Not once did ESPN attempt to put a clamp on their investigation and, in fact, the network ran stories on their research before the book was published. For more than two decades the NFL has denied the link between concussions and brain injuries despite the mountain of evidence to the contrary, the book states. In fact, the NFL attempted to stifle reports on the concussion issue. In fairness, the NFL has taken aggressive steps to curtail helmet-to-helmet collisions by increasing on-field penalties and off-field fines. In addition any player showing signs of a concussion must clear a medical exam before allowed to return to action. This is an issue that wont go away. And this new book tells why. Its a book that should be read by football fans, parents and coaches. Twins Prospect Rosario Hit With Major Drug Suspension The Minnesota Twins No. 5-ranked prospect, Eddie Rosario, who hit .302 last season over 122 games combined with the Fort Myers Miracle and Double-A New Britain, has been suspended for 50 games without pay for a second violation of baseballs Minor League Drug Prevention and Treatment Program. The 22-year-old Rosario, a native of Puerto Rico, was a fourth round selection by the Twins in the 2010 Major League Draft. He was originally drafted as an outfielder but has been converted to a second baseman. In 52 games played here last season for Fort Myers before being promoted to New Britain, Rosario hit .329 with 35 RBIs. Everblades Home This Weekend Against First-Place South Carolina The Florida Everblades are home this weekend at Germain Arena with the opportunity to close the gap with first-place South Carolina. The Everblades began the week with a 20-10-1-1 season record, nine points behind South Carolina in the ECHL South Division. Florida faces the Stingrays at 7:30 p.m. tonight, Friday, and 7 p.m. Saturday. The local hockey team also is home next weekend against Orlando. Morgan,11, Bakes To Raise Funds For AnimalsEleven-year old Morgan Spivey spent her New Years Eve baking homemade sweets as a fundraising endeavor and raised $271. Parents Tricia and Randall Spivey Jr. matched what Morgan had raised for a total of $542 donated to Lee County Domestic Animal Services. The donation will help provide veterinary care for sick and injured animals. Lee County Domestic Animal Services wishes to thank the Spivey family for their generosity in helping us to save more lives, Director Donna Ward said. For more information about the Lee County Animal Care Trust Fund or to donate, log onto www.leelostpets.com. Lee County Domestic Animal Services Office Manager Brandon Scribner accepts a donation from Morgan Spivey School Smartby Shelley M. Greggs, NCSPDear Shelley, My daughter, who is eight years old, has been home-schooled and is now going to public school for the first time this January. I want to be a good parent, help my child, and be active at her school. What kinds of things can I do that will be helpful? Justine L, Fort Myers, Florida Justine, Parent involvement with both your child and the school is one of the most important things you can do to help your child be successful. Sometimes it is difficult to make that connection with the school given a busy work schedule or if your own school experience was not a good one, however, this is an extremely important relationship that is worth developing. According to research reported by the National Association of School Psychologists, when families are involved in education, there are very positive benefits for students, teachers and families. Students display better attitudes toward school and learning, higher achievement and test scores, improved behavior, increased homework completion, greater participation in academic activities and improved school attendance. At home, parents can make sure that they: Monitor homework completion talk with your children about their assignments, understand what they are studying and review their progress Participate in leisure reading with your children at all ages its fun to read the same books as your children and then discuss them Communicate often with your children about academic and behavioral expectations, give them constructive praise and support Here are a few ways for parents to be active at school: Participate at school as volunteers and committee members Participate in school functions, athletics and other extracurricular activities Regular communication with the teacher(s) about your childs progress Participation in adult educational opportunities offered by the school Active involvement in school decisions as presented by the school or board of education Many teachers have special activities designed for parent volunteers. Make sure to ask your childs teachers what would be helpful. Very often the schools parent association will have projects and committees where you can volunteer. While it may be easier to join a parent group or volunteer when your child is in elementary school, it is equally important to stay involved while your child is in high school. Volunteering with other parents during the high school years can help parents stay connected to each other in an informal parent network, which is always helpful. These are just a few suggestions on how to become and stay involved in your childs educational journey. There are many more ways to be involved; the key factor is that you are involved. Ms. Greggs is adjunct faculty at Edison State College where she teaches psychology and education courses. She is also Nationally Certified School Psychologist and consultant for School Consultation Services, a private educational consulting company. Questions for publication may be addressed to smgreggs@gmail.com. Not all questions submitted can be addressed through this publication. Tour De CapeLee Memorial Health System is cosponsoring the addition of a Kids & Family Mini Tour to the City of Cape Corals 2014 Tour De Cape annual ride at Cape Harbour. The event is part of a family fun-filled weekend that offers the opportunity to educate cyclists about safety. Were excited to include children in this years Tour De Cape. Its a great way for us to educate families about safety since children account for about 60 percent of all cycling-related injuries treated at hospital emergency departments, explained Sally Kruescher. Its such a wonderful event, and we want everyone to be safe and have a great time. According to the CDC, while only one percent of all trips taken in the U.S. are by bicycle, bicyclists face a higher risk of crash-related injury and deaths than occupants of motor vehicles do. All cyclists, even adults, can protect themselves by wearing a properly fitted helmet when they ride. The Mini Tour route is a three mile safe, flat, kid-friendly course that tours Cape Harbour, located at 5710 Chiquita Blvd. Young riders must be 7 to 13 years old, off training wheels and accompanied by a parent. Children must also wear helmets to participate. Lee Memorial Health System will provide safety helmets to as many as 50 lucky young riders at the event, complete with helmet fittings, as well as safety presentations and a video for all participants during lunch. Registration for Tour De Cape is currently open. Onsite pre-registration begins on Friday, January 17 from 5 to 8 p.m. at Cape Harbour. On Saturday, January 18, onsite registration runs from 6:30 to 7:45 a.m. Then, a 5K walk/run starts the Tour De Cape at 8 a.m. The Kids & Family Mini Tour will also take place on Saturday. The cost is $5 per rider. It includes a three-mile route, a hot dog lunch and a T-shirt. Registration starts at 9 a.m., and the Mini Tour begins at 10 a.m. Adult bicycle rides begin on Sunday. The 60and 100-mile courses begin at 8 a.m., and the 15and 30-mile courses begin at 8:30 a.m. A post-event celebration with live music will be held on Sunday from 1 to 5 p.m. at Cape Harbour. For more information, call 573-3123 or visit www.tourdecape.net. DID YOU KNOW My Stars FOR WEEK OF JANUARY 13, 2014ARIES (March 21 to April 19) Romantic aspects are high at this time for single Lambs looking for love. Warm and fuzzy feelings also are at enhanced levels for Rams and Ewes in paired relationships. TAURUS (April 20 to May 20) This week favors what Taureans dote on -namely, love and money. Look for more meaningful relationships for both singles and pairs, as well as an improved financial outlook. GEMINI (May 21 to June 20) All lingering shreds of that recent bout with boredom are dissipated as you eagerly accept a challenging offer. Your positive mood persuades others to join you in this venture. CANCER (June 21 to July 22) You might need validation for a possible solution to a situation involving someone close to you. Consider asking a trusted friend or relative to help you with this problem. LEO (July 23 to August 22) Investigate carefully before agreeing to assist a friend or colleague with a personal problem. There might be hidden factors that could emerge later that will create problems for you. VIRGO (August 23 to September 22) Your decision to work with an associate rather than go it alone, as you first proposed, brings an unexpected bonus. Be careful not to be judgmental. Allow for free and open discussion. LIBRA (September 23 to October 22) A loved ones health problem could, once again, make demands on your time and attention. But this time, make some demands of your own, and insist that others pitch in and help. SCORPIO (October 23 to November 21) This is a good time for the traditionally staid Scorpion to plan adjustments in your day-today schedules. Be more flexible and allow for more impromptu, off-the-cuff actions. SAGITTARIUS (November 22 to December 21) Avoid creating unnecessary fuss over a situation you dont approve of. If its going to work, it will do so despite your objections. If it fails, it will do so without a push from you. CAPRICORN (December 22 to January 19) Working with a trusted colleague could open your mind to exploring some considerations you previously dismissed out of hand. The weekend brings news from a loved one. AQUARIUS (January 20 to February 18) Resolving a recent problem leaves you in a good position to strengthen your influence on how things get done. But continue to encourage ideas and suggestions from others. PISCES (February 19 to March 20) A new friend suggests an interesting opportunity. But check it out before you snap at it. It might be a good deal for some people, but it might not work in helping you reach your goals. BORN THIS WEEK: You have a way of helping people solve their problems, making you a most-respected counselor and trusted friend. On Jan. 17, 1865, Union Gen. William T. Shermans army is delayed in Savannah, Ga., by 10 days of rain as it waits to begin marching into the Carolinas. Just as Sherman and his army had destroyed nearly everything in its path in Georgia, Sherman planned to subject the Carolinas to the same brutal treatment. On Jan. 16, 1919, the 18th Amendment to the U.S. Constitution, prohibiting the manufacture, sale, or transportation of intoxicating liquors for beverage purposes, is ratified and becomes law. In 1933, the 21st Amendment to the Constitution repealed prohibition. On Jan. 15, 1936, Edsel Ford, son of auto pioneer Henry Ford, forms a philanthropic organization called the Ford Foundation with a donation of $25,000. The foundation was established in part as a legal way for the Ford family to avoid inheritance taxes. On Jan. 14, 1954, Hollywood star Marilyn Monroe marries New York Yankees slugger Joe DiMaggio. The marriage barely got past the honeymoon, and they were divorced 274 days later. In her filing, Monroe accused her husband of mental cruelty. On Jan. 13, 1962, comedian Ernie Kovacs, who hosted his own television shows during the 1950s, dies after crashing his Chevrolet Corvair into a telephone pole in Los Angeles while driving in a rainstorm. The Corvair was later made infamous by Ralph Naders groundbreaking 1965 book, Unsafe at Any Speed. On Jan. 18, 1985, for the first time since joining the World Court in 1946, the United States walks out of a case, this one concerning U.S. paramilitary activities against the Nicaraguan government. The Court decided against the United States; it charged that the U.S. violated international law with its actions against the Sandinistas. On Jan. 19, 1977, President Gerald Ford pardons Tokyo Rose, a Japanese-American woman named Iva Toguri. Toguri and other women had broadcast sentimental American music and phony announcements in a vain attempt to destroy the morale of Allied soldiers during World War II. It was noted American writer and essayist Flannery OConnor who made the following sage observation: Truth does not change according to our ability to stomach it. Even though the human brain makes up only 2 percent of the bodys mass, it consumes 20 percent of the bodys calories and oxygen. The chief translator for the European Parliament is named Ioannis Ikonomou. He is fluent in 32 languages -and still learning. During World War I, the United States acquired its first war dog. The pit bull was found wandering around Yale Field in New Haven, Conn., by soldiers in training. On particular soldier, Cpl. Robert Conroy, became close to the dog and refused to leave Stubby behind; when Conroy was shipped out, he hid the dog on board. Stubby served overseas for 18 months and saw action in 17 battles. On more than one occasion he sniffed out surprise attacks, saving his regiment. He was known for locating wounded soldiers on the field, and he even once caught a German spy. He was the most decorated dog of the Great War, and he was promoted to sergeant for his combat service -the only dog to be so honored. After the war, Sgt. Stubby was hailed as a hero; he led parades and met three presidents. He even has his very own brick at the World War I Memorial. It reads, Sergeant Stubby, Hero Dog of WWI, a Brave Stray. Those who study such things say that couples in a romantic relationship actually have heart rates that are in sync with each other. If youre like the average American, you drink 23 gallons of coffee every year, but only 9 gallons of tea. Research is what Im doing when I dont know what Im doing. -Wernher Von Braun THIS WEEK IN HISTORY STRANGE BUT TRUE THOUGHT FOR THE DAY PUZZLE ANSWERS 1. GENERAL KNOWLEDGE: Who designed the Statue of Liberty? 2. ANIMAL KINGDOM: What is a beavers home called? 3. LANGUAGE: In the international phonetic alphabet, what word represents the letter Y? 4. MONEY: What is the basic currency of Poland? 5. GEOGRAPHY: What nation is Baffin Island a part of? 6. TELEVISION: Who was Steve McGarretts nemesis in the series Hawaii Five-O? 7. HISTORY: Who was the first postmaster general appointed by Americas Continental Congress? 8. MOVIES: Which two comedians starred as friends in the movie Stripes? 9. MEDICINE: What is trepanning? 10. SCIENCE: How fast do hummingbirds wings move? TRIVIA TEST 1. Frederic Bartholdi 2. A lodge 3. Yankee 4. Zloty 5. Canada 6. Wo Fat 7. Benjamin Franklin 8. Bill Murray and Harold Ramis 9. Cutting a hole in the skull to relieve pressure 10. Their wings flap between 12 and 80 times a second. ANSWERS25 THE RIVER JANUARY 10, 2014 SPORTS QUIZ 1. The Marlins Juan Pierre, in 2013, became the seventh player to have 600 or more career steals, and more steals than walks. Name three of the other six. 2. Which of the following pitchers had more 20-win seasons for the Minnesota Twins: Bert Blyleven, Jim Perry, Johan Santana or Frank Viola? 3. When was the last time before the 2012 season that Stanfords football team won a Rose Bowl? 4. Who was the last Portland Trail Blazers player before guard Damian Lillard (2012-13) to have at least 1,500 points and 500 assists in a season? 5. How many consecutive playoff series did the New York Islanders win starting in 1980? 6. In 2013, Matthew Centrowitz became the second U.S. male to win two World Championship medals in track and fields 1,500 meters. Who was the first? 7. In 2013, Jason Dufner tied a record at the PGA Championship by shooting a round of 63. How many others have shot a round of 63 at the PGA Championship? ANSWERS 1. Lou Brock, Bert Campaneris, Vince Coleman, Arlie Latham, Otis Nixon and Willie Wilson. 2. Jim Perry, who did it twice. All the others did it once for the Twins. 3. It was the 1971 season. 4. Clyde Drexler, in the 1991-92 season. 5. Nineteen. 6. Bernard Lagat. 7. Eleven others.